If you're new to Chicago and looking for apartments in Chicago suburbs, then what you're looking for is Premier Luxury Suites. Premier Luxury Suites offers affordable and elegant temporary housing throughout the Chicagoland area. Our short term apartments are perfect for both travelers and newcomers to the Chicago suburbs whether your stay is expected to last a matter of months or less. Premier Luxury Suites is the perfect place to board while you're getting settled in town or getting business done, so have a look through our listings of apartments in Chicago suburbs and surrounding areas. Many people are drawn to Chicago because it is a hub of industry and commercial affairs, but the most memorable aspect of the city is its cultural value. Chicago is home to such beautiful scenery as Grant Park, Buckingham Fountain, Michigan Avenue, and Millennium Park. From the museums to Wrigley Field and the stunning architecture all around the city, the opportunity to experience Chicago is truly something to cherish. So don't just waste money on any apartments in Chicago suburbs; relax in one of Premier Luxury Suites' gorgeous and indulgent temporary housing accommodations, because spending time in Chicago with Premier Luxury Suites is the most indulgent and affordable way to transform a great experience into an extraordinary experience. When you stay in a travel apartment as refined and aesthetic as those offered by Premier Luxury Suites, the beauty you find all around Chicago doesn't stop when you get home. 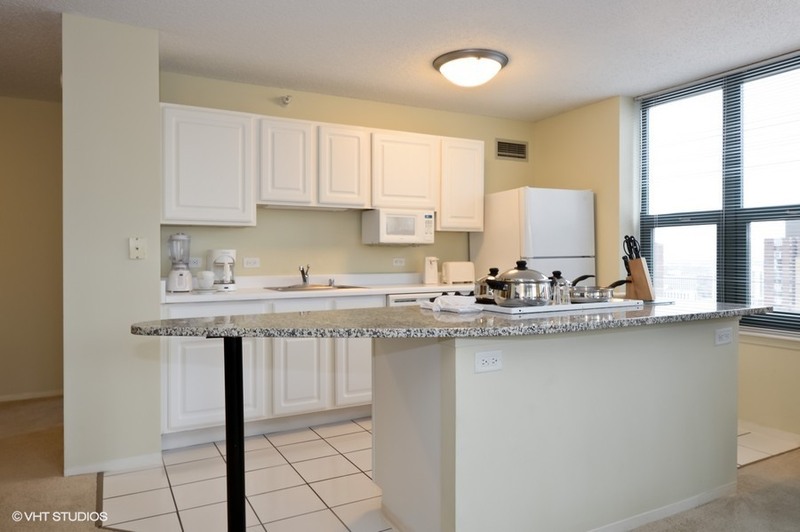 When you have use for short term apartments in Chicago suburbs, call Premier Luxury Suites. Because every offering by Premier Luxury Suites is generously furnished, you don't have to waste time tending to your home when you come to Chicago to make memories and build accomplishments. Whether you're a travelling executive or a relocating family, we understand that your life can be busy. All of our accommodations are equipped with furnishings essential to your comfort as well as amenities such as high-speed internet, a telephone, and cable TV. In addition to these conveniences, many of our more centrally located apartments in Chicago suburbs offer weekly maid services, so that you can spend less time worried about domestic upkeep and more time pouring your heart into the things that matter to you. No matter what interests bring you to Chicago, Premier Luxury Suites has a "home away from home" for you. Our offerings range from Arkadia Tower to Wolf Point West in Chicago proper and other properties available all around Chicagoland, from Evanston and Des Plaines to Arlington Heights. Wherever you need to find apartments in Chicago suburbs, Premier Luxury Suites has a conveniently located property for you. With everything we have to offer, from complete practical furnishings to the opulent ambience that earns respect from peers and business leaders alike, Premier Luxury Suites is the clear choice for anyone who finds themself on a journey to Chicago away from home. At the nexus of style, comfort, and affordability, Premier Luxury Suites is in the ideal location in the executive housing industry, and we want to help you find the locations of your ideal apartments in Chicago suburbs.